If you’re looking for a wine country weekend getaway in Northern California skip the crowds in Napa and head further north to beautiful Sonoma County. North Sonoma County boasts some of the finest wine areas in the state including Dry Creek, Alexander Valley, Chalk Hill and Russian River Valley. The luxurious Hotel Healdsburg, consistently on the Conde Nast Traveler Gold List and Travel + Leisure’s World’s Best Awards, is the perfect place to call home during your wine country escape. Hotel Healdsburg has much to offer with gorgeous rooms, a beautiful pool, relaxing spa, country gardens and Charlie Palmer’s Dry Creek Kitchen restaurant. 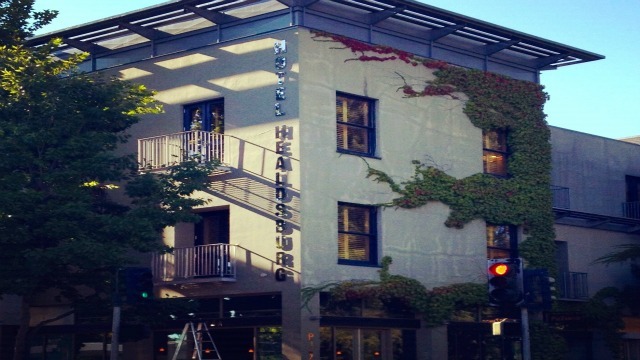 Perfectly located on the historic Healdsburg town plaza you can leisurely stroll to a number of boutique shops, restaurants and art galleries from this luxury hotel. If you feel like being a bit more active borrow one of the bikes the hotel has available to its guests for a little cruise to explore the area. Then of course there are the outstanding wineries in the area to enjoy a day of tasting some of the best wines in California. Last night was date night! Ozdane and I decided to try a restaurant we hadn’t been to in the Marina Bay Sands Resort and Casino here in Singapore….